This book is written with two goals in mind. The first is to derive the 32 crystallographic point groups, the 14 Bravais lattice types and the 230 crystallographic space group types. The second is to develop the mathematical tools necessary for these derivations in such a manner as to lay the mathematical foundation needed to solve numerous basic problems in crystallography and to avoid extraneous discourses. To demonstrate how these tools can be employed, a large number of examples are solved and problems are given. The book is, by and large, self-contained. In particular, topics usually omitted from the traditional courses in mathematics that are essential to the study of crystallography are discussed. For example, the techniques needed to work in vector spaces with noncartesian bases are developed. Unlike the traditional group-theoretical approach, isomorphism is not the essential ingredient in crystallographic classification schemes. Because alternative classification schemes must be used, the notions of equivalence relations and classes which are fundamental to such schemes are defined, discussed and illustrated. For example, we will find that the classification of the crystallographic space groups into the traditional 230 types is defined in terms of their matrix representations. Therefore, the derivation of these groups from the point groups will be conducted using the 37 distinct matrix groups rather than the 32 point groups they represent. We have been greatly influenced by two beautiful books. Hermann Heyl's book entitled Symmetry based on his lectures at Princeton University gives a wonderful development of the point groups as well as an elegant exposition of symmetry in art and nature. Fredrik W. H. Zachariasen's book entitled Theory of X-ray Diffraction in Crystals presents important insights on the derivation of the Bravais lattice types and the crystallographic space groups. These two books provided the basis for many of the ideas developed in this book. The theorems, examples, definitions and corollaries are labelled sequentially as a group whereas the problems are labelled separately as a group as are the equations. The manner in which these are labelled is self-explanatory. For example, T4.15 refers to Theorem (T) 15 in Chapter 4 while DAl.l refers to Definition (D) 1 in Appendix (A) 1. We have strived to write this book so that it is self-teaching. The reader is encouraged to attempt to solve the examples before appealing to the solution presented and to work all of the problems. In the Revised Edition we have corrected the errors, misprints and omissions that we have found and our students and other users have kindly pointed out to us. The Revised Edition also includes a more comprehensive index and a set of solutions for all of the problems presented in the book. Mathematical Crystallography represents a new direction for the Reviews in Mineralogy series. 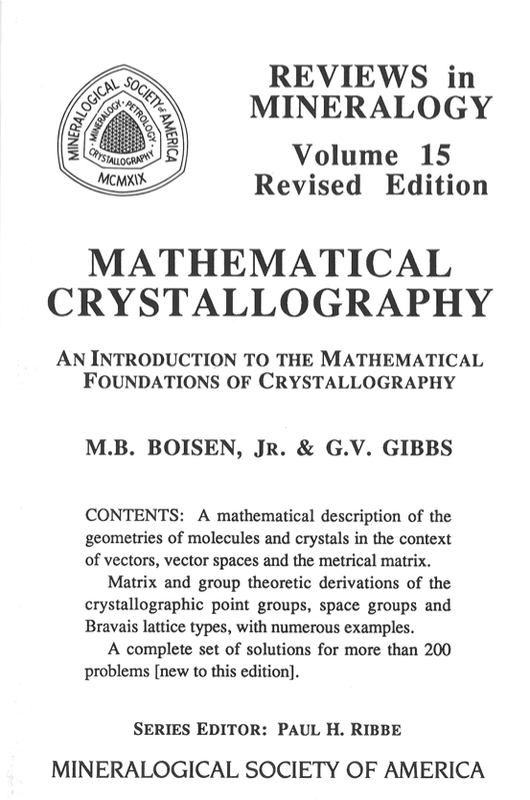 This text book is not a review volume in any sense of the term, but in fact it is, as its subtitle suggests, An Introduction to the Mathematical Foundations of Crystallography. Written by a mathematician, M. B. Boisen, Jr., and a mineralogist, G. V. Gibbs, Volume 15 was carefully prepared and illustrated over a period of several years. It contains numerous worked examples, in addition to problem sets (many with answers) for the reader to solve. The book was first introduced at a Short Course of the same title in conjunction with the annual meetings of the Mineralogical Society of America and the Geological Society of America at Orlando, Florida, October 24-27,1985.